The Cover Story from Issue 1: What is Jarry? Very limited quantities of Issue 1 remain in stock. Order yours now before it's gone! Early in the Jarry project, we discovered Blake Bashoff through his Instagram feed. All his beautiful food shots (he has a penchant for galettes) made us salivate, and interspersed among them are portraits of a ruggedly handsome, tattoo'ed guy working outdoors—petting a horse, tilling a garden, eating a peach, usually shirtless. As we got to know him a little better and learned more about his background, his work in food, and his big-picture projects, he seemed perfect for what we were trying to capture with Jarry. He's smart, charming, funny, handsome, talented, and making a name for himself in the food world. We'd found our cover guy. 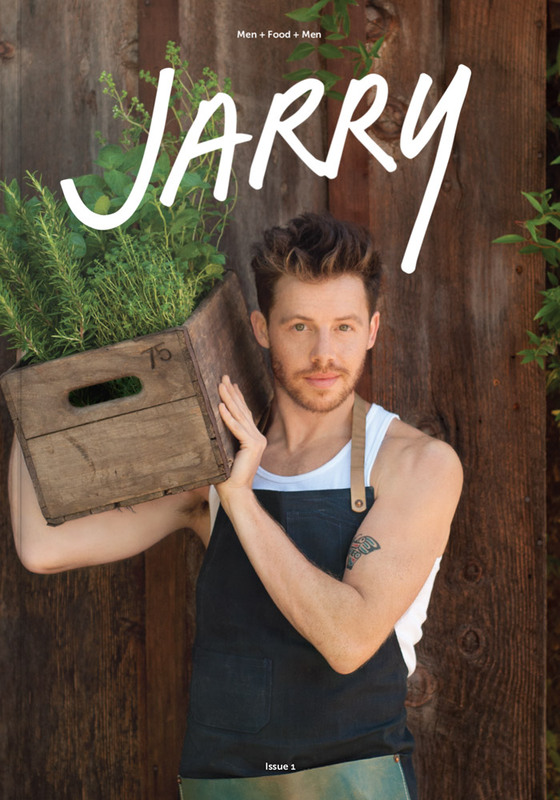 So one weekend last June, the Jarry team flew out to California to photograph and meet him in-person at his employer Anjelica Huston's—yes, you read that right—ranch in the foothills of the Sequoias. 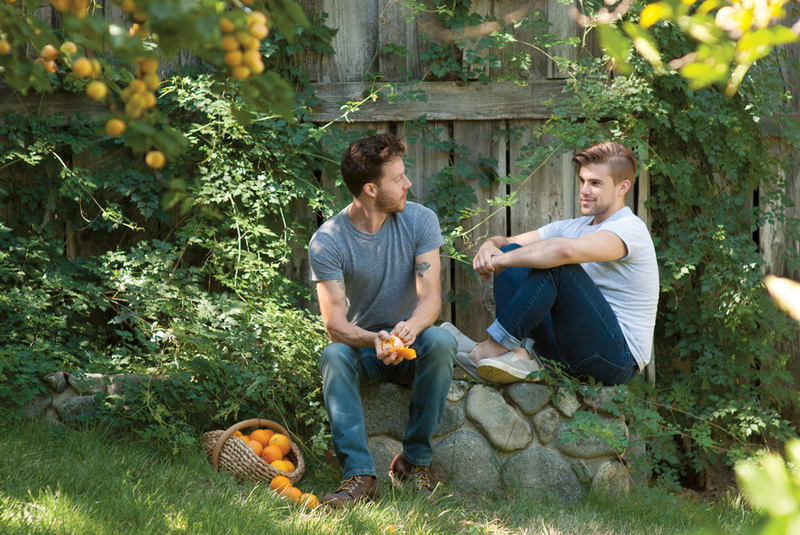 This ranch is a bona fide sanctuary, with goats, horses, gardens and orchards, and eclectic little cottages tucked into the landscape, and Blake and his boyfriend, the photographer Nick Turner who would be taking shots, made us feel entirely at home. It was a long day in the sun, but to cap it off, Blake treated us to a fireside feast served under a thick ceiling of stars. We dined for hours with the members of his ranch family, feeling far from Brooklyn but strangely at home. Get to know Blake a little more in the following conversation he had with Jarry Editorial Director Lukas Volger. Lukas Volger: So, Blake, what do you do for a living? Blake Bashoff: I’m Anjelica Huston’s personal cook. BB: Right. Anjelica has a ranch in the foothills of the Sierra Nevadas. She calls it her Old MacDonald farm. It’s our little world made by hand and a magical place. I saw the space for the first time in 2009 and I felt an instant connection—we have this dream of creating a retreat where people can stop for a meal on their way to Sequoia National Park. This would help bring awareness to the Central Valley, which is America’s agricultural heartbeat. When I first visited, I fell immediately in love. It was winter, and the trees were heavy with pomegranates and Meyer lemons were literally falling off the branches. Such glorious resources at your fingertips! 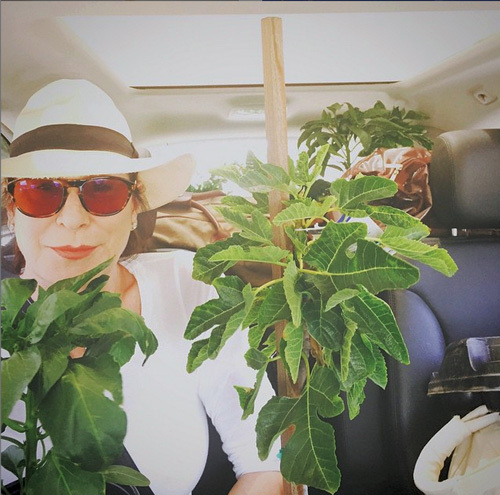 Anjelica made a deal with herself that every time she visited her ranch she would plant something in the earth. LV: Meyer lemons falling off the branches! I hope you preserved some of them. BB: Oh yes! And Meyer Lemon curd. We make holiday baskets for her family and friends every year. Jams, jellies, salsas, tamales, et cetera. Everything grown on the land and made from scratch. LV: How long has she been making these holiday baskets? BB: For years. Last year we added granola and this year we are going to add Goat Milk soap from our very own, beautiful new goats, infused with lavender from the garden. LV: Did the property come with all of this bounty, or did she cultivate it? 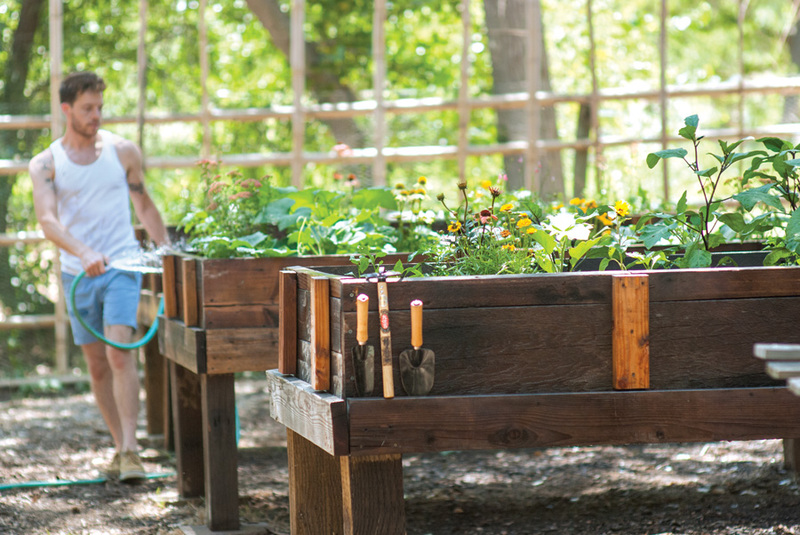 BB: Anjelica made a deal with herself that every time she visited her ranch she would plant something in the earth. LV: What did you do before you started working for her? BB: I’ve been an actor for over 25 years. Prior to my new life in food, performing was my only gig. I did television, film, and Broadway—I recurred on Lost and Mad Men and Judging Amy for a few seasons, and did a bunch of other episodic television over the years. I played Moritz in Spring Awakening on Broadway and the first national tour—that was definitely one of my favorite jobs. LV: Do you prefer musical theater over television? BB: There’s nothing quite like the energy and electricity of being on stage in front of a live audience. But each medium has its challenges, rhythms and rewards. LV: But you’re not acting too much anymore. BB: If a good opportunity comes up, I’m there. But I’m not as hungry for it as I once was, and you kind of have to be. The older I’ve gotten, the less in love with show business I’ve become. I have immense respect for working actors today. It can definitely wear at your soul. LV: Switching gears: Instagram. I love all your food photos on Instagram. BB: Thanks! I think it’s a great platform for sharing original content and connecting with people from all over. It’s like a world of mini art galleries. LV: Do you feel that Instagram changed the way you cook at all? BB: It’s definitely given me confidence. BB: For sure! And other times I’m like, “Ew, this won’t do.” But I wouldn’t say Instagram dictates my cooking. LV: Also, you met boyfriend Nick [Turner, photographer for this piece and the cover—and featured above in bottom right photo] over Instagram, right? LV: It’s true. And this may just be subjective, but I feel that Instagram has been an especially vibrant network for gay guys. BB: Well, I’m guilty of the occasional shirtless selfie, I admit that. But I keep a sense of humor about it. You have to. Food has always been a huge part of my life. I’ve been cooking since I was a kid. LV: Did you grow up cooking, gardening, working in soil, etc? BB: Food has always been a huge part of my life. I’ve been cooking since I was a kid. The kitchen was always the heart of our home. We would sit down to family dinner at least five times a week. Mom would do most of the cooking, and both my grandmothers were excellent cooks. For me, it all started with them. Watching them, helping them, especially around the holidays when we would all gather. LV: What’s your family’s style of cooking? BB: We eat like peasants! I mean that in the best sense. Straightforward, lovely food. We’ve always cooked and eaten with the seasons. Braises in winter, tons of salads in summer. And wine. Lots of wine! LV: Was there a learning curve with the switch from home cook to personal chef? Can you describe a typical day at work? BB: You sort of learn as you go, every day is different. Much of it depends on Anjelica’s schedule. But it always includes menu planning and shopping the local farmers’ markets. Keeping a well-stocked pantry, too. I originally started cooking for her dinner parties, which was intimidating and exhilarating. The first thing I made for her was spring lamb with salsa verde, salt crusted new potatoes, and a rhubarb galette. She was hooked! LV: Sounds like a great meal for a first date! BB: It sort of was our first date! LV: So how does that work as a personal cook? She says, “I feel like Beef Bourguignon” in the morning, or does she leave it to you decide, and sit down at the table to a surprise? BB: Sometimes we’ll collaborate if she’s having a dinner party, but more often than not I just surprise her. I know what she likes by now and I can sort of anticipate what she might crave. For example, something warm after a massage like a green curry or a calming soup. LV: Where do you find recipe inspiration? Which cookbooks do you keep coming back to? BB: I have a big collection of cookbooks, but I always return to the same few, mainly for ideas. I grew up devouring cookbooks where other boys read comics. I love anything by Elizabeth David and Richard Olney. The Art of Simple Food by Alice Waters is my bible. David Tanis’ books. Oh! And the Zuni Cafe cookbook. BB: I do love a galette! What’s not to love? Give me a galette or a fruit crisp over cake any day. I get so inspired by the season’s produce—I love making salads and dressings and also things that require sloooow cooking. BB: Yes. Praise the braise! LV: And your least favorite food? BB: I HATE cold butter—unless you’re making pastry. And I don’t care for overdressed salad greens. Blech! LV: Preach. So is cooking a creative outlet for you? Does it satisfy a similar itch that acting does? BB: Oh god, yes, it’s a creative outlet—a performance in a way. And it’s definitely a form of storytelling. It’s another expressive art where you can put yourself on the plate. BB: … with your own distinct point of view, yes. Which is where I think food culture and gay culture intersect. Hello, Jarry! LV: Totally! What’s the message of your cooking? 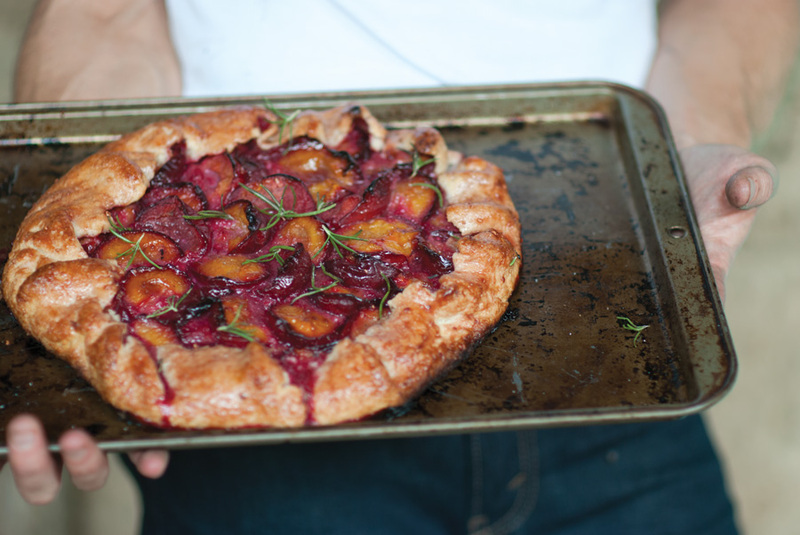 Blake's Fruit Galette—see below for recipe! You can use all kinds of fruit and fruit combinations for these rustic, open-faced tarts—stone fruit and berries in summer, apples and pears in the fall. For the dough, combine 1 cup flour, 1 1/2 teaspoons sugar, and 1/4 teaspoon salt in a large mixing bowl. Cut in 6 tablespoons cold, cubed unsalted butter until the mixture resembles coarse meal. Gradually scatter 4 tablespoons ice water over the top (a dribble of apple cider vinegar in the ice water lends a nice tang and tenderness to the crust) and toss until the dough just comes together. Press into a disk, wrap in plastic, and chill for 1 hour. On a lightly floured surface, roll it out into a large circle about 1/8-inch thick. Transfer to a parchment-lined baking sheet and refrigerate while you prepare the fruit. You’ll want approximately 4-5 cups fruit in total, pitted and/or sliced as necessary, and sprinkled with sugar accordingly. You may need anywhere from 1/4 cup to 3/4 cup—start with less, taste, and use your judgment. Add the grated zest of 1 lemon, a squeeze of its juice, and a pinch of salt. For fruit that is very juicy add 2 tablespoons flour, cornstarch, or ground arrowroot. Then arrange the prepared fruit in the center of the dough, leaving a 2-inch border. Fold the edges up over the fruit, pleating as you go to secure the filling inside. Chill in the freezer for about 15 minutes. Preheat the oven to 400° F. Brush the cold pastry border with a little egg wash and sprinkle generously with sugar. Bake on the bottom rack for 45 to 60 minutes, until the juices are bubbling and the crust is well browned. Cool on a wire rack. Serve warm or at room temperature with crème fraîche or ice cream if you’d like. Issue 1 is now sold out—but buy and download the digital issue PDF and read now!